The life and times of Ronald Firbank, writer and fantasist and his last memorial in Campo Verano Cemetery, Rome. The Firbank family were based in Newport, South Wales for several generations. Ronald Firbank was a fantasy writer whose family built the railways in and around South Wales. There are several streets in Newport named after the Firbanks. A homosexual fop and eccentric Ronnie’s mother was descended from an Irish dynasty, her father was a clergyman. Ronnie lived the latter part of his madcap life in London, and touring the bohemians quarters of North Africa and Europe to inspire his writing. His books are now cult classics, the covers also carry rare designs by the artists Keith Vaughan and Andy Warhol, both devotees of Firbank. Ronnie at his best includes some of the funniest, but most brutal caricatures of his contemporaries that roamed in the likes of the Café Royal and posh London hotels. 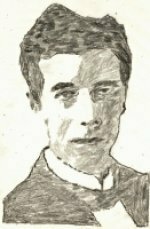 Ronald Firbank died suddenly in Rome in 1926. The death created a story script that is as farcical and warped as any of Ronnie’s books with his internment alongside John Keats and Percy B Shelley in Rome’s Protestant Cemetery. This act was only to be met with horror from Ronnie’s odd ball sister Heather, who pointed out that Ronnie was in fact a Catholic. He was exhumed but could not be buried quickly as the famous Campo Verano Catholic Cemetery in Rome was still planning a space for non Roman Europeans who died in the City. After lying abandoned in a crypt for 8 months ultimately Ronnie was laid to rest , but his grave was overlooked and neglected for 80 years. William Cross ( and his co-writer Monty Dart ) have spent several years cleaning up Ronnie’s grave. That story is also told in detail with many photographs of their renovation process.